Using case studies from the Middle East, South Asia, Southeast Asia, and the Pacific Basin, this book examines the global trend of violence against religious places and figures. The contributors believe attacks on sacred places to be particularly damaging to peace and harmony because of the centrality of religion in many Asian and Pacific countries. A diverse range of topics are covered, including an empirical exploration of the global trends of violence against sacred spaces; attacks against and policies toward holy sites in Israel and the Palestinian Territories; the fate of Indian Islamic monuments after India gained independence in 1947; the Christian community's response to the increasing Islamization of Malaysia, and the future of communalism in Malaysia. Africa and Australia are also referenced in the work. 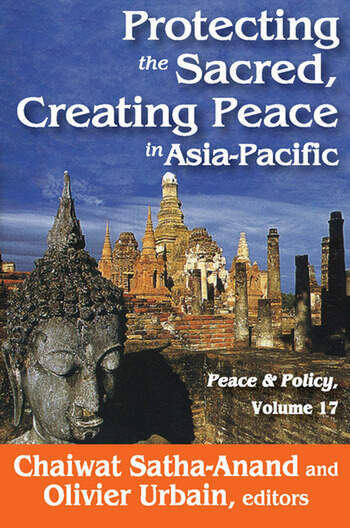 Taken together, this volume explores the importance of protecting sacred spaces, holy symbols, and religious people as a crucial element in fostering peace in the world, and especially the Asia-Pacific region. The contributors argue that much of the violence in the world is rooted in politics of religious identity.